For women, breast cancer is a threatening reality. In fact, one in eight will develop invasive breast cancer at some point during her lifetime, according to Breastcancer.org. With early detection and progressive treatments, however, two-thirds of women have the potential to triumph over breast cancer. Though still in it is infancy, artificial intelligence (AI) is poised to revolutionize the healthcare industry. Due to the technology’s algorithm, AI can essentially “learn” from the user, streamlining tasks and providing a more personalized experience. A recent study shows the market for AI in healthcare is expected to grow from $667.1 million to $7.9 billion by 2022. For healthcare providers, the benefits of leveraging AI are endless. In health imaging specifically, AI plays a crucial role in how breast cancer is detected and diagnosed. The technology is the foundation for new innovative tools that improve radiologist efficiency and accuracy in detecting breast cancer. Despite its benefits, many healthcare providers – and patients – remain cautious of AI. Radiologists fear they will be replaced by this technology. Patients fear AI will lead to lack of human oversight and an increase in errors in managing their healthcare. 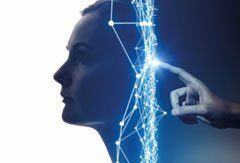 However, radiologists should look at AI as a complement to their current responsibilities, as their full capabilities go far beyond what AI can do. Instead, it’s important to consider the ways in which AI can enhance productivity and streamline workflows, particularly as many are increasingly experiencing burnout due to the sheer amount of work they face each day. Embracing AI solutions can supplement their duties, helping them more quickly detect breast cancer. There also seem to be many questions related to AI’s data collection and accuracy. In order for AI to reach its full potential, solutions must be implemented correctly in order to fully understand and process complex forms of data. With AI solutions relying on deep learning capabilities, many fear this can lead to identification of incorrect patterns and potentially inaccurate diagnoses when in reality, AI delivers speed and accuracy that humans cannot match. As such, these capabilities help providers streamline workflows and supports faster, more confident detection of breast cancer, resulting in effective patient care. As vice president, medical director at iCAD, Jeffrey has participated in developing mammographic AI solutions for 25 years. He has provided clinical insight to engineering and marketing teams and managed the design and implementation of clinical studies for FDA approval of mammographic AI products—from iCAD’s first mammography CAD product SecondLook in 2002 to iCAD’s most recent digital breast tomosynthesis AI solution, PowerLook Tomo Detection. iCAD, a global leader in medical technology providing innovative cancer detection and therapy solutions, is the manufacturer of PowerLook Tomo Detection, the first and only U.S. Food and Drug Administration (FDA) approved concurrent-read cancer detection solution for DBT. Utilizing a trained algorithm developed through deep learning, the system automatically analyzes each tomosynthesis plane and identifies suspicious areas. These images are then blended into a 2-D synthetic image, providing radiologists with a single, highly sensitive, enhanced image from which they can easily navigate the tomosynthesis datasets. iCAD works passionately to provide precise, powerful healthcare solutions expertly engineered to optimize operational efficiency, clinician confidence and patient outcomes. PreviousPrevious post:Artificial intelligence drives reading efficiency in breast imagingNextNext post:What is the NHS Clinical Entrepreneurs Programme?